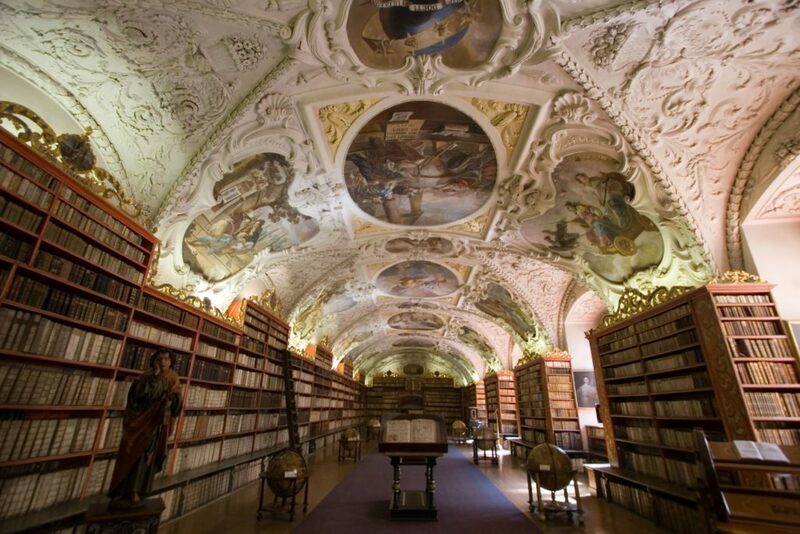 Guided tour through the interior of The Strahov Library is scheduled on June 5, 2018. The Strahov Monastery is the oldest Premonstratensian monastery in Bohemia and one of the most important architectural landmarks in the Czech Republic. Backed by Vladislaus II of Bohemia, Bishop of Olomouc Henry Zdík promoted the establishment of a monastery. The Strahov Monastery was founded in 1143 near the path leading to the prince’s castle, at a site where guards stood watch (the name Strahov is derived from the Czech word „strahovat“, to stand guard), and formed when a community of Premonstratensian monks from Steinfeld in the Rhine Valley settled at Strahov. In the complex there is the church of the Assumption of the Blessed Virgin Mary, The Strahov Gallery, one of the most significant Central European collections of Gothic painting, Rudolfian art, Baroque and Rococo paintings, and the rare Strahov Library. After the tour you can have a beer or dinner in popular Strahov Monastic Brewery offering its own beer, distinctive ambiance and good Czech cuisine.